Last year, I set up email newsletters for my top three sites because everyone says you should. I got a virtual mailbox so I wouldn’t have to put my home address in emails. I chose ActiveCampaign to manage my lists. MailMunch opt-in lists helped my lists grew rapidly. I took courses and read dozens of articles on growing your email list. So why did I suddenly get rid of it all this year? Should you dump your email list? Instead of putting money toward boosting and extra FB posts, I am pitching more dedicated email sponsorship, additional blog posts, integrations on Pinterest and IG stories. I’m just going to explain why I chose to drop mine because no one else is making that case. Last week, I spent hours on Google trying to find anyone who would make the case that not every website/business model requires an email list. I eventually found one blogger, but she forced me to sign up for her email list to read her downloadable freebie about it (I unsubscribed as soon as the freebie came through.) I also found an article about a company dumping their email list because of GDPR, and we’ll talk more about that in a minute, but that’s kind of another issue. All the top-ranked articles in Google on the topic are written by email service providers and/or bloggers using their affiliate links. 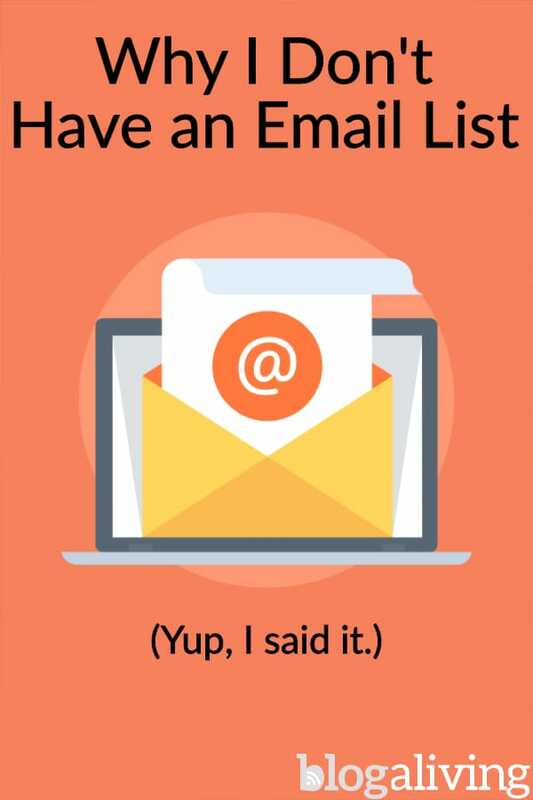 They’re all unanimous: you must build an email list! And please sign up here to do it! But while they may be biased, I don’t say they’re full of it. (I also used affiliate links here, and I wouldn’t recommend those services if I didn’t think some of you might need them.) I just say there’s another side to this. Sell a product your email list is interested in buying. Write sponsored posts (brands may pay more if they know you can shoot an email to a lot of engaged subscribers about your latest sponsored posts). Are an affiliate for products or services (not Amazon, remember?) that your email list wants to buy. Drop new posts often and see a spike in traffic every time you alert the list about it. I’m sure there are others, too. I look at everything I do for my business in terms of ROI or “return on investment.” For me, the question isn’t: “Is there any benefit to having an email list?” because of course there is. The question is: “Is there enough benefit to having an email list?” And for me, the answer was no: the time and money investment wasn’t justified. Because my sites were already established and MailMunch works beautifully, my lists grew at a nice pace. That meant my ActiveCampaign costs grew quickly, too. I went on an absolutely miserable hunt for a more affordable solution, but among the standard providers that actually deliver, AC’s “lite” option is about as affordable as it gets. Worse, I realized there’d been massive price escalations in just the past few months. Some services I’d priced as recently as November had tripled or quadrupled their pricing in the last six months! In business, we all have to raise our prices now and again, but that’s ridiculous. What were there prices going to be in another six months? And form providers like MailMunch had also raised their prices – they now start at $20/month, and several of them want around $30 a month for each site. So for around 3,000 subscribers, I was going to have to pay ActiveCampaign $69/month, MailMunch about $14 (grandfathered into the old pricing structure, thankfully) and $15 for a virtual mailbox. That’s about $98 a month. I wasn’t making anything like that off my little email list. So my options were: find a cheaper way to send emails or figure out how to make more money from my list. There’s a software program called Sendy that costs $59 (one-time fee). You set it up on your own server and hook it up to AmazonSES, or Simple Email Service, which allows you 62,000 emails for free each month and charges $0.10 for every thousand emails after that. And they have excellent deliverability. This is the cheapest solution I found, but you need to be fairly techie. I am fairly techie, and I managed to set up both Sendy and AmazonSES without ripping out all my hair. But then it turned out my host wouldn’t allow the number of cron jobs Sendy requires (for good reason). That meant I needed to set up my own VPS and be 100% responsible for its security. Yikes – that’s a lot of work, and a steep learning curve for me. But to anyone who feels comfortable running a VPS, I recommend checking out Sendy. I also checked out some “hybrid” systems that work with AmazonSES, but host the script on their own servers. They started at $15-20 per month for 10,000, which is much cheaper than traditional ESPs. But I always test support before buying in, and I wasn’t impressed with any of them. They all boasted about the companies that were using them, but were very slow to get back to me and didn’t fully answer my questions when they did. I felt they didn’t want the business of freelancers like me. I could have decided to roll up my sleeves and spend a few more weeks figuring it all out for myself, but I have a lot of other work to do. The usual response to the argument I just made is: “Well, you must not know how to make money off your list!” Guess what? I agree! And as far as I can tell, based on unsubscribes and feedback, my subscribers only wanted to be notified about new posts. They didn’t want to hear about old posts or get affiliate links to products I like or hear about interesting articles I had found. Another thing about email for me is that I feel horribly artificial when I write emails to strangers. I never overcame that in the year I was trying to do it. And so I’d dread writing an email, and then I’d write it and worry about it for days before getting up the nerve to hit send. It was stressful and it took up loads of time I don’t have. I love most of what I do as a blogger. But email is so miserable for me that the only way I’d consider doing it again is if I get to the point where I can hire someone to handle it all for me. There’s another argument I hear why we must all have email lists. It goes something like this: “But Google’s and Facebook’s algorithms change! They can ban you or penalize you! Email is the only traffic you control because you own your list!” Well, I’ve been developing websites since before Google was around. I have survived every single algorithm change they and Facebook have made. Everything is always changing, and that includes email. You have to be prepared with workarounds, contingencies, and whole new approaches. This argument ignores the fact that you can also buy traffic from Google, Facebook, and others, and it is extremely reliable. Unlike email, you only pay when people actually click the ad. And on some platforms, you can target your ads so specifically that you’re getting exactly the sort of visitors who will become fans or buy from your affiliate links or whatever it is you do to make money on your site. Are you sure email will give you a better ROI than social media and search ads? Let’s talk CAN-SPAM. The fines are up to $16,000 per violation. And guess what constitutes a violation? But that’s nothing. Europe’s GDPR bill – which we must comply with, or risk huge fines – means all your European email subscribers must have subscribed through a double opt-in procedure and “unambiguous consent.” If you haven’t always used double opt-in – and this includes requiring an email address for a freebie or commenting system and then subscribing them to your email list without making it crystal clear that in giving you the email, they are signing up for the list – then you must take some corrective steps. You could probably try switching your entire list to “unconfirmed”, re-sending the confirmation email, and losing a ton of subs through that process. But remember, Honda got huge fines for doing that very thing. When you run ads through Facebook, Google, or Pinterest, they take on that burden for you. They sort out how to comply with those laws, and they’re the ones who get fined if they serve your ads to someone they shouldn’t have. You only need to comply with the rules of the companies you use to advertise. Studies show that email is still bigger than free social media posts for sending traffic. But they never compare email to social media ads. And what about email vs. AdWords or BingAds? What if I took that $98 a month and bought Facebook or Pinterest ads instead? Or Adwords? Or even snail mail, if I was in a niche where that works (yes, they still exist)? This is exactly what I’m going to do, and I’ll update the post eventually with details of how it’s going. Everyone advises you start your email list early (which means immediately taking on the costs of at least a PO box/virtual mailbox and an email provider). But when I started list building last year on two sites with established traffic, my lists grew quickly. The more established your site is, the more quickly it will grow. So I’m going to focus on growing my traffic through advertising. If that gets me to a point where I have enough money left over to pay someone to manage a Sendy installation and handle emails for my sites, great. It’s a pity email is so expensive that there’s no longer an entry point for hobbyists and bloggers who are trying to build a community more than make a living. Oh, sure, all the ESPs have a free tier, but you grow out of it pretty quickly. I hope now it’s clear why there’s no single answer for everybody. Would I benefit from an email? Sure… just not enough to justify the intense money, time, and energy costs. I believe I can get equal results from things that are set-and-forget, like social media ads. I’ll be keeping an eye out, though. If Amazon ever creates their own service to work with SES, or someone comes up with a more supportive hybrid SES system, I’ll check out the costs and do another ROI analysis. If Amazon ever decides to let us put affiliate links in emails, or if my audiences ever start responding to non-Amazon affiliate links on my sites, I’ll reconsider.